A stick on which flax or wool was wound ready for hand-spinning before the spinning-wheel came into use. It was held under the left arm, or stuck in the girdle, of the spinner. The fibers were drawn from it and twisted by the thumb and forefinger of the right hand. The thread so spun was wound on an oval reel, generally provided at its thickest part with a ring hanging from the thread and turning with it during spinning in order to insure regularity of the movement. 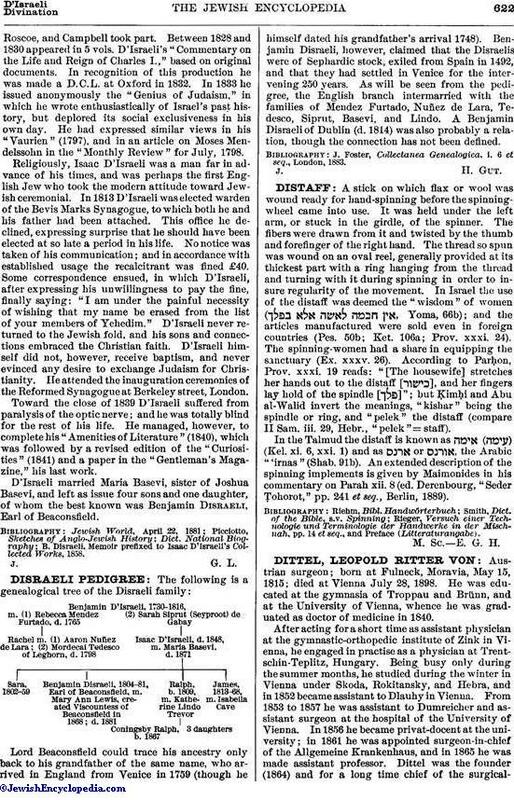 In Israel the use of the distaff was deemed the "wisdom" of women ( , Yoma, 66b); and the articles manufactured were sold even in foreign countries (Pes. 50b; Ket. 106a; Prov. xxxi. 24). The spinning-women had a share in equipping the sanctuary (Ex. xxxv. 26). According to Parḥon. Prov. xxxi. 19 reads: "[The housewife] stretches her hands out to the distaff [ ], and her fingers lay hold of the spindle [ ]"; but ḲimḤi and Abu al-Walid invert the meanings, "kishar" being the spindle or ring, and "pelek" the distaff (compare II Sam. iii. 29, Hebr., "pelek" = staff). In the Talmud the distaff is known as ) (Kel. xi. 6, xxi. 1) and as or , the Arabic "'irnas" (Shab. 91b). An extended description of the spinning implements is given by Maimonides in his commentary on Parah xii. 8 (ed. Derenbourg, "Seder Ṭohorot," pp. 241 et seq., Berlin, 1889). Rieger, Versuch einer Technologie und Terminologie der Handwerke in der Mischnah, pp. 14 et seq., and Preface (Litteraturangabe). M. Sc. E. G. H.